API: Move landscape implementations into separate directory, thus headers should be included as <ViennaRNA/landscape/move.h>, <ViennaRNA/landscape/neighbor.h>, etc. API: Remove implicit exit() calls from global MFE backtracking implementation. API: Add generic soft constraints support to suboptimal structure prediction sensu Wuchty et al. This version fixes two regressions in comparative structure prediction. In particular, we adapt the computation of base pairing probabilities and Boltzmann sampling to the changes introduced with Version 2.4.4, and restore dot-bracket based hard constrained base pairs that got lost with Version 2.4.2. This version introduces a correction with respect to the handling of dangling end contributions in exterior loops when computing the partition function for multiple sequence alignments! Therefore, the ensemble free energies and equilibrium probabilities computed with programs such as RNAalifold and RNAplfold may slightly differ compared to previous versions. The above correction can briefly be described as a harmonization of the partition function model compared to the MFE implementation, where end-gaps in the alignment can never contribute any stability to helices branching off the exterior loop. This version adds hard/soft constraints support for our implementations of sliding-window structure prediction as used in the executable programs RNALfold and RNAplfold. Together with the new feature of hard- and soft-constraints for sliding-window structure prediction we unified and corrected the implementations used in the tools RNALfold, RNALalifold, and RNAplfold. All the above tools now use the same definition of maximum base pair span. This means that for a maximum base pair span of L the recursions only consider base pairs (i, j) with (j - i + 1) ≤q; L.
Locally optimal structures that are part of another, larger locally optimal structure are filtered out. This mainly affects the output of RNALfold that sometimes did not filter properly. Note, however, that filtering is only performed for consecutive hits!. Thus, it may still happen that locally optimal substructures appear in the output. Locally optimal structure must not be branched in the exterior loop. This rule was not considered in the output of RNALalifold and thus has a large impact on the hits obtained from that tool. Therefore, comparing the output of the above tools against that of version 2.3.5 or less will most likely result in differences. This version also adds a new software sub-package, RNAlocmin. Detailed information on this tool can be obtained here. Additionally, we also add a PDF version of the RNA Bioinformatics tutorial as available on our homepage to the default instalation target. This version introduces the first transitions towards a more flexible, callback-function based RNA secondary structure decomposition. The so-called unstructured domains feature extends the RNA folding grammar with alternative handling of self-enclosed unpaired stretches in an RNA structure. This enables one, for instance, to model protein binding to single stranded sequence motifs, while addressing the competition between base pairing and binding affinity of the ligand. The entire extension is not only available using our RNAlib C-library, but also through the Perl and Python scripting interfaces. The program RNAfold already includes a convenience method to add unstructured domain sequence motifs and their corresponding binding free energy through easy-to-use command files. For further details, we refer to our publication "RNA folding with hard and soft constraints", the section on Unstructured Domains and Domain extensions commands of the RNAlib reference manual, and the manpage of RNAfold. This version introduces tons of new features. First of all, the new hard- and soft-constraints allow for easy manipulation of the prediction recursions. For instance, SHAPE reactivity data can be directly converted to soft-constraints and readily used in MFE, and partition function computations. Ligand binding to hairpins and interior loops with specific sequence/structure motifs, e.g. accessible through RNAfold, is another feature that became possible due to the new constraints framework. Most of the new features we've implemented into RNAlib require specific new functions that, partially, replace already existing ones. Therefore, with this version, we start introducing the new v3.0 API, that will eventually replace the one currently existing. All functions of the new API are now prefixed with vrna_ that not only makes them easily recognizable, but also provides some sort of namespacing that helps in the development of third-party programs linking agains RNAlib. Through usage of a generic data structure for all secondary structure prediction algorithms, most functions that implement a special algorithm, such as MFE, or partition function, are now polymorphic. Thus, there is only one single function in the interface that can deal with multiple variations of input, such as single sequences or sequence alignments. However, we will maintain complete backward compatibility until v3 of the ViennaRNA Package. We also started to make the new API accessible through the Perl and Python interface, where we introduce a new object-oriented way to use the RNAlib. Please see the RNAlib Reference Manual, and the individual manpages of the executable programs in the ViennaRNA Package for further details on new features, and feature changes. First polymorphic functions vrna_mfe(), vrna_pf(), and vrna_pbacktrack(). Ligand binding to hairpin- and interior-loop motif support in C-library and scripting language interfaces. This version fixes a major bug in the energy evaluation of exterior loops and multibranch loops! In previous versions of the ViennaRNA Package starting with version 2.0, the energy contributions for dangling ends and terminal mismatches of exterior- and multibranch loops were not applied correctly. This problem appeared due to a defective parser that converts the Turner 2004 energy parameters into ViennaRNA code. Therefore, if you compare predictions, e.g. from RNAfold 2.1.9, with those of versions prior to 2.1.9, they may differ. In general, the differences in predicted structures and energies should be very small. However, it may happen that results are totally different. To assess the impact of the fixed energy parameter usage we re-ran all benchmarks as applied for the original publication of The ViennaRNA Package 2.0. The resulting performance measures suggest, that the impact is actually very small, although predictions seem to be slightly better with version 2.1.9. See the ViennaRNA Package 2.0 - Performance page for details. Python and Perl interface are compiling again under MacOSX. See Install Notes. Provision of python2 interface support. This interface is very basic at the moment and the configure script default is to disable it. If you want to try it out, use it at your own risk. Comments and remarks about usability are welcome. The ViennaRNA Package was recently extended to take a certain class of higher-order structure motifs, so called G-quadruplexes, into account, too. Here, the four consecutive stretches of "+" mark the G-G interactions within the G-quadruplex. 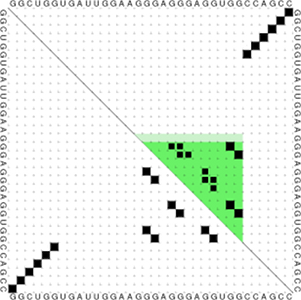 On calculation of base pairing probabilities, the dot-plot output of RNAfold contains the Boltzmann probabilities of a G-quadruplex delimited by sequence position i and j, depicted by a green triangle, as well as the individual G-G interaction probabilities displayed like canonical base pair interactions. This introduces a new commandline option '--gquad/-g' that enables G-quadruplex prediction. The dot-bracket notation for the structure output now contains an additional character '+' that indicates the presence of such a G-tetrad. Consecutive '+' signs always come in sets of 4 interspaced by some '. ', marking the four G-runs and its linker sequences that comprise the quadruplex, respectively. To enable fast plotting of RNA2Dfold output we now also provide two gri-scripts "2Dlandscape_mfe.gri" and "2Dlandscape_pf.gri". The auxilary energy parameter files in the source tree now reside in the 'misc' directory. They are, however, still installed at the same locations as in previous versions of the Package. However, since all cofolding functions currently rely on the global variable 'cut_point', they are not considered really threadsafe yet, i.e. a change in the cut_point while concurrent calculations take place will result in unpredictable results! Added pkg-config file in the distribution to allow easy checks for certain RNAlib2 versions, compiler flags and linker flags. This makes linking of third party programs agains RNAlib2 much more easier.